I never put live my old installation, then a few weeks later I lost the machine where it was and then I just simple forget. Now after playing a little here are the details for the installation (again). If you have any zaptel hardware it is now recommended to edit /etc/default/zaptel or /etc/sysconfig/zaptel and set there an optimal value for the variable MODULES . We copy the shared library manually into the system folder. On the channels menu you will be able to see the chan_h323 availabble for installation. After starting Asterisk and logging into the console type the command show channeltypes to check that H323 has been install and is running. Then you have to follow the next post with the details of the Avaya-Asterisk H323 ip trunk. It works on Suse (it is not my favourite distro but i had no option). No problem, compiled perfect and working one h323 trunk! 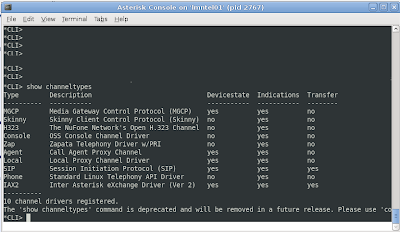 Asterisk exited on signal 9.